Like a hawk's eyes, the high resolution cameras on NASA's Cassini spacecraft have spotted yet another small, previously unknown moon circling giant Saturn and one which may indicate the existence of other small bodies in the same region. The tiny world--presently thought to be only about 2 kilometers (1 mile) wide--orbits at 197,700 kilometers (122,800 miles) from Saturn. Until a name for the moon is chosen by the International Astronomical Union, the moon has been given the provisional designation S/2007 S 4. The moon was first spotted in Cassini images taken on May 30, 2007. Subsequent searches through images taken by Cassini over the previous three years turned up additional detections of the moon and helped researchers refine their calculations of its orbital path. S/2007 S 4 orbits Saturn between the paths of Methone and Pallene, two small moons, about 4 kilometers (2.6 miles) wide, also discovered in Cassini images in 2004. All three moons orbit between much larger Mimas and Enceladus. Moons surrounding the giant planets generally are not found where they originally formed because tidal forces from the planet can cause them to drift from their original locations. In drifting, they may sweep through 'resonances'--i.e., locations where other moons disturb them--and suffer orbit-changing perturbations. The new moon, like Methone, is in such a resonance with Mimas and appears to have undergone such an evolution. 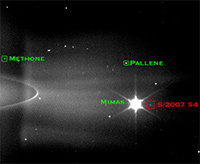 "The fact that both Methone and S/2007 S 4 are dynamically locked with Mimas gives us a clue about their orbital history," said Carl Murray, a professor at Queen Mary, University of London, and the member of the Cassini Imaging Team leading the work on the new moon. "There are numerous examples of these resonant mechanisms between moons in the Saturn system and they probably arise due to tides. In the case of these two small moons, the resonance ensures that they cannot hit Mimas, at least in the short term." Because the orbits of all three small moons lie close together, researchers think they may be remnants of a larger population. "This trio of objects could be remnants of a collision or perhaps they are the lucky survivors of a larger population of material that failed to form a moon," said Murray. "Either way there does seem to be a family connection. If we could get good data about their surfaces with Cassini, we could begin to unravel some of these mysteries." Cassini imaging scientists are already busy looking for future opportunities to zoom in on the new moon and refine its orbit, and to search for other companions. "We've already identified times in the near future when we can take some pre-planned images and re-target them to get a closer look at this new body," said Carolyn Porco, imaging team leader and director of CICLOPS at the Space Science Institute. "And of course we're always on the lookout for additional moons. There are likely to be more of these very small bodies out there, and we hope to find them." By chance, Cassini will approach the newly discovered moon at a distance of 11,700 kilometers (7,300 miles) at the end of December 2009, assuming the mission is extended beyond the summer of 2008, its nominal end. Images taken at that time could be useful for understanding the moon's shape, composition, and history. A movie showing S/2007 S 4 orbiting Saturn can be found at http://ciclops.org, http://www.nasa.gov/cassini and http://saturn.jpl.nasa.gov. The Cassini-Huygens mission is a cooperative project of NASA, the European Space Agency and the Italian Space Agency. The Jet Propulsion Laboratory (JPL), a division of the California Institute of Technology in Pasadena, manages the Cassini-Huygens mission for NASA's Science Mission Directorate, Washington. The Cassini orbiter and its two onboard cameras were designed, developed and assembled at JPL. The imaging team consists of scientists from the U.S., England, France and Germany. The imaging operations center and team leader (Dr. C. Porco) are based at the Space Science Institute in Boulder, Colo.